Microsoft cofounder Paul Allen has been diagnosed with lymphoma. The 56-year-old Allen was diagnosed with diffuse large B-cell lymphoma earlier this month, according to a letter sent by his sister, Jody Allen, to employees of his investment company Vulcan. It is a non-Hodgkin's form of the disease. 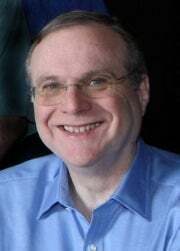 Allen left Microsoft in 1983 after being diagnosed with Hodgkin's disease. "This is tough news for Paul and the family. But for those who know Paul's story, you know he beat Hodgkin's a little more than 25 years ago and he is optimistic he can beat this, too," Jody Allen said in the e-mail, sent Monday. "He continues to work and he has no plans to change his role at Vulcan," she added. Vulcan spokesman David Postman confirmed Jody Allen sent the e-mail on Monday. After leaving Microsoft, Allen founded Vulcan and subsequently invested in DreamWorks SKG, Oxygen Media and cable provider Charter Communications. He owns the National Football League's Seattle Seahawks and the Portland Trail Blazers, a National Basketball Association team. Jody Allen is president and CEO of Vulcan. I want to let you know that Paul was recently diagnosed with non-Hodgkin's lymphoma. He received the diagnosis early this month and has begun chemotherapy. Doctors say he has diffuse large B-cell lymphoma, a relatively common form of lymphoma. This is tough news for Paul and the family. But for those who know Paul's story, you know he beat Hodgkin's a little more than 25 years ago and he is optimistic he can beat this, too. Paul is feeling OK and remains upbeat. He continues to work and he has no plans to change his role at Vulcan. His health comes first, though, and we'll be sure that nothing intrudes on that. We would ask you to respect Paul's privacy and not discuss this outside of the office. If you have any questions, please ask your EC member. Thank you in advance for what I know will be all your good thoughts for Paul.